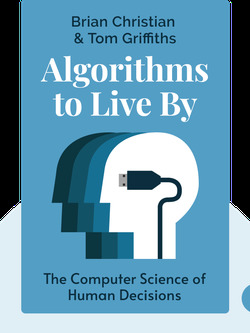 Algorithms to Live By (2016) is a practical and useful guide that shows how algorithms have much more to do with day-to-day life than you might think. And not just that; they can also lead to a better life by helping you solve problems, make decisions and get more things done. Algorithms help both humans and computers to solve problems. The word actually dates back to the ninth century, when it was first used by the Persian mathematician Muhammad al-Khwarizmi. But the use of algorithms can be traced roughly four thousand years back, to the Sumerian civilization. Simply put, an algorithm is a finite series of steps that help solve a problem – and it’s a technique we use all the time. Even a recipe can be thought of as an algorithm: you follow a series of instructions to get the desired result, a delicious meal. The same can be said for the pattern you follow to knit a scarf or put together some Ikea furniture. And when you’re putting together a list of pros and cons to decide whether or not to accept a job offer or to make a big decision, you’re also following what’s known as an intuitive algorithm. By their very nature, the intuitive algorithms that humans use aren’t precise. We use them in times of uncertainty to make the best decision we can, like weighing the potential benefits against the risks of jumping into a new business investment. Therefore, these intuitive algorithms may seem rather subjective and random compared to the mathematical algorithms a computer uses, though they basically provide the same solution. Take the unpleasant task of apartment hunting. Most people go into this process with a set of criteria in mind: a minimum amount of space, a certain distance from school or work, a maximum amount of rent. When these conditions are met, that’s when you take the next step and sign the lease. This is essentially the same method that computer algorithms use, and in the next blinks we’ll explore how these methods can work for you. Most of the time, algorithms can tell us when to stop pressing our luck. Mathematical algorithms can help you decide when it’s time to explore something new. You don’t always need help sorting your files, but if you do, algorithms can help. When it comes to organizing data, there’s a lot you can learn from computers. Algorithms can help us schedule our lives, but they also have their limits. The right algorithms can help you predict the future. Algorithms help us to exchange messages and handle data overload. There are algorithms to help figure out what people will do and guide them when making decisions. It’s important to know that algorithms have their limits. Start your free Blinkist trial to get unlimited access to key ideas from Algorithms to Live By and over 3,000 other nonfiction titles. With bitesize text and audio, it's easier than ever to find the right ideas to transform your life.